Maurits Cornelis Escher (Dutch pronunciation: [ˈmʌurɪt͡s kɔrˈneːlɪs ˈɛʃər]; 17 June 1898 – 27 March 1972) was a Dutch graphic artist who made mathematically-inspired woodcuts, lithographs, and mezzotints. Despite wide popular interest, Escher was for long somewhat neglected in the art world, even in his native Netherlands. He was 70 before a retrospective exhibition was held. In the twenty-first century, he became more widely appreciated, with exhibitions across the world. 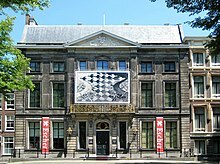 Maurits Cornelis[a] Escher was born on 17 June 1898 in Leeuwarden, Friesland, the Netherlands, in a house that forms part of the Princessehof Ceramics Museum today. He was the youngest son of the civil engineer George Arnold Escher and his second wife, Sara Gleichman. In 1903, the family moved to Arnhem, where he attended primary and secondary school until 1918. Known to his friends and family as "Mauk", he was a sickly child and was placed in a special school at the age of seven; he failed the second grade. Although he excelled at drawing, his grades were generally poor. He took carpentry and piano lessons until he was thirteen years old. Moorish tessellations including this one at the Alhambra inspired Escher's work with tilings of the plane. He made sketches of this and other Alhambra patterns in 1936. 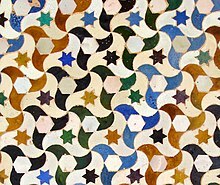 Escher's painstaking[b] study of the same Moorish tiling in the Alhambra, 1936, demonstrates his growing interest in tessellation. 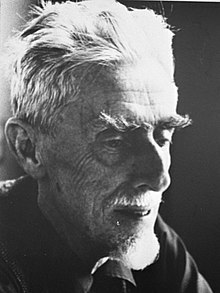 Escher returned to Italy and lived in Rome from 1923 to 1935. While in Italy, Escher met Jetta Umiker – a Swiss woman, like himself attracted to Italy – whom he married in 1924. The couple settled in Rome where their first son, Giorgio (George) Arnaldo Escher, named after his grandfather, was born. Escher and Jetta later had two more sons – Arthur and Jan. It remains an extremely absorbing activity, a real mania to which I have become addicted, and from which I sometimes find it hard to tear myself away. The sketches he made in the Alhambra formed a major source for his work from that time on. He also studied the architecture of the Mezquita, the Moorish mosque of Cordoba. This turned out to be the last of his long study journeys; after 1937, his artworks were created in his studio rather than in the field. His art correspondingly changed sharply from being mainly observational, with a strong emphasis on the realistic details of things seen in nature and architecture, to being the product of his geometric analysis and his visual imagination. All the same, even his early work already shows his interest in the nature of space, the unusual, perspective, and multiple points of view. In 1935, the political climate in Italy (under Mussolini) became unacceptable to Escher. He had no interest in politics, finding it impossible to involve himself with any ideals other than the expressions of his own concepts through his own particular medium, but he was averse to fanaticism and hypocrisy. When his eldest son, George, was forced at the age of nine to wear a Ballila uniform in school, the family left Italy and moved to Château-d'Œx, Switzerland, where they remained for two years. The Netherlands post office had Escher design a semi-postal stamp for the "Air Fund" in 1935, and again in 1949 he designed Netherlands stamps. These were for the 75th anniversary of the Universal Postal Union; a different design was used by Surinam and the Netherlands Antilles for the same commemoration. Escher, who had been very fond of and inspired by the landscapes in Italy, was decidedly unhappy in Switzerland. In 1937, the family moved again, to Uccle (Ukkel), a suburb of Brussels, Belgium. 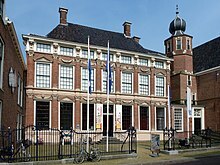 World War II forced them to move in January 1941, this time to Baarn, Netherlands, where Escher lived until 1970. Most of Escher's best-known works date from this period. The sometimes cloudy, cold, and wet weather of the Netherlands allowed him to focus intently on his work. After 1953, Escher lectured widely. A planned series of lectures in North America in 1962 was cancelled after an illness, and he stopped creating artworks for a time, but the illustrations and text for the lectures were later published as part of the book Escher on Escher. He was awarded the Knighthood of the Order of Orange-Nassau in 1955; he was later made an Officer in 1967. In July 1969 he finished his last work, a large woodcut with threefold rotational symmetry called Snakes, in which snakes wind through a pattern of linked rings. These shrink to infinity toward both the center and the edge of a circle. It was exceptionally elaborate, being printed using three blocks, each rotated three times about the center of the image and precisely aligned to avoid gaps and overlaps, for a total of nine print operations for each finished print. The image encapsulates Escher's love of symmetry; of interlocking patterns; and, at the end of his life, of his approach to infinity. The care that Escher took in creating and printing this woodcut can be seen in a video recording. 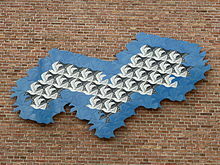 Escher moved to the Rosa Spier Huis in Laren in 1970, an artists' retirement home in which he had his own studio. He died in a hospital in Hilversum on 27 March 1972, aged 73. He is buried at the New Cemetery in Baarn. Escher's work is inescapably mathematical. This has caused a disconnect between his full-on popular fame and the lack of esteem with which he has been viewed in the art world. His originality and mastery of graphic techniques are respected, but his works have been thought too intellectual and insufficiently lyrical. Movements such as conceptual art have, to a degree, reversed the art world's attitude to intellectuality and lyricism, but this did not rehabilitate Escher, because traditional critics still disliked his narrative themes and his use of perspective. However, these same qualities made his work highly attractive to the public. Escher is not the first artist to explore mathematical themes: Parmigianino (1503–1540) had explored spherical geometry and reflection in his 1524 Self-portrait in a Convex Mirror, depicting his own image in a curved mirror, while William Hogarth's 1754 Satire on False Perspective foreshadows Escher's playful exploration of errors in perspective. Another early artistic forerunner is Giovanni Battista Piranesi (1720–1778), whose dark "fantastical" prints such as The Drawbridge in his Carceri ("Prisons") sequence depict perspectives of complex architecture with many stairs and ramps, peopled by walking figures. Only with 20th century movements such as Cubism, De Stijl, Dadaism, and Surrealism did mainstream art start to explore Escher-like ways of looking at the world with multiple simultaneous viewpoints. However, although Escher had much in common with, for example, Magritte's surrealism, he did not make contact with any of these movements. In his early years, Escher sketched landscapes and nature. He also sketched insects such as ants, bees, grasshoppers, and mantises, which appeared frequently in his later work. His early love of Roman and Italian landscapes and of nature created an interest in tessellation, which he called Regular Division of the Plane; this became the title of his 1958 book, complete with reproductions of a series of woodcuts based on tessellations of the plane, in which he described the systematic buildup of mathematical designs in his artworks. He wrote, "Mathematicians have opened the gate leading to an extensive domain". After his 1936 journey to the Alhambra and to La Mezquita, Cordoba, where he sketched the Moorish architecture and the tessellated mosaic decorations, Escher began to explore the properties and possibilities of tessellation using geometric grids as the basis for his sketches. He then extended these to form complex interlocking designs, for example with animals such as birds, fish, and reptiles. One of his first attempts at a tessellation was his pencil, India ink, and watercolour Study of Regular Division of the Plane with Reptiles (1939), constructed on a hexagonal grid. The heads of the red, green, and white reptiles meet at a vertex; the tails, legs, and sides of the animals interlock exactly. It was used as the basis for his 1943 lithograph Reptiles. His first study of mathematics began with papers by George Pólya and by the crystallographer Friedrich Haag on plane symmetry groups, sent to him by his brother Berend, a geologist. He carefully studied the 17 canonical wallpaper groups and created periodic tilings with 43 drawings of different types of symmetry. [c] From this point on, he developed a mathematical approach to expressions of symmetry in his artworks using his own notation. Starting in 1937, he created woodcuts based on the 17 groups. His Metamorphosis I (1937) began a series of designs that told a story through the use of pictures. In Metamorphosis I, he transformed convex polygons into regular patterns in a plane to form a human motif. He extended the approach in his piece Metamorphosis III, which is four metres long. Although Escher did not have mathematical training—his understanding of mathematics was largely visual and intuitive—his art had a strong mathematical component, and several of the worlds that he drew were built around impossible objects. After 1924, Escher turned to sketching landscapes in Italy and Corsica with irregular perspectives that are impossible in natural form. His first print of an impossible reality was Still Life and Street (1937); impossible stairs and multiple visual and gravitational perspectives feature in popular works such as Relativity (1953). House of Stairs (1951) attracted the interest of the mathematician Roger Penrose and his father, the biologist Lionel Penrose. In 1956, they published a paper, "Impossible Objects: A Special Type of Visual Illusion" and later sent Escher a copy. Escher replied, admiring the Penroses' continuously rising flights of steps, and enclosed a print of Ascending and Descending (1960). The paper also contained the tribar or Penrose triangle, which Escher used repeatedly in his lithograph of a building that appears to function as a perpetual motion machine, Waterfall (1961). Escher was interested enough in Hieronymus Bosch's 1500 triptych The Garden of Earthly Delights to re-create part of its right-hand panel, Hell, as a lithograph in 1935. He reused the figure of a Mediaeval woman in a two-pointed headdress and a long gown in his lithograph Belvedere in 1958; the image is, like many of his other "extraordinary invented places", peopled with "jesters, knaves, and contemplators". Thus, Escher not only was interested in possible or impossible geometry but was, in his own words, a "reality enthusiast"; he combined "formal astonishment with a vivid and idiosyncratic vision". Escher worked primarily in the media of lithographs and woodcuts, although the few mezzotints he made are considered to be masterpieces of the technique. In his graphic art, he portrayed mathematical relationships among shapes, figures, and space. Integrated into his prints were mirror images of cones, spheres, cubes, rings, and spirals. The mathematical influence in his work became prominent after 1936, when, having boldly asked the Adria Shipping Company if he could sail with them as travelling artist in return for making drawings of their ships, they surprisingly agreed, and he sailed the Mediterranean, becoming interested in order and symmetry. Escher described this journey, including his repeat visit to the Alhambra, as "the richest source of inspiration I have ever tapped". Escher's interest in curvilinear perspective was encouraged by his friend and "kindred spirit", the art historian and artist Albert Flocon, in another example of constructive mutual influence. Flocon identified Escher as a "thinking artist" alongside Piero della Francesca, Leonardo da Vinci, Albrecht Dürer, Wenzel Jamnitzer, Abraham Bosse, Girard Desargues, and Père Nicon. Flocon was delighted by Escher's Grafiek en tekeningen ("Graphics in Drawing"), which he read in 1959. This stimulated Flocon and André Barre to correspond with Escher and to write the book La Perspective curviligne ("Curvilinear perspective"). The flat shape irritates me—I feel like telling my objects, you are too fictitious, lying there next to each other static and frozen: do something, come off the paper and show me what you are capable of! ... So I make them come out of the plane. ... My objects ... may finally return to the plane and disappear into their place of origin. Escher's artwork is especially well-liked by mathematicians such as Doris Schattschneider and scientists such as Roger Penrose, who enjoy his use of polyhedra and geometric distortions. For example, in Gravitation, animals climb around a stellated dodecahedron. The two towers of Waterfall's impossible building are topped with compound polyhedra, one a compound of three cubes, the other a stellated rhombic dodecahedron now known as Escher's solid. 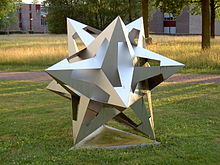 Escher had used this solid in his 1948 woodcut Stars, which also contains all five of the Platonic solids and various stellated solids, representing stars; the central solid is animated by chameleons climbing through the frame as it whirls in space. Escher possessed a 6 cm refracting telescope and was a keen-enough amateur astronomer to have recorded observations of binary stars. Escher carefully studied Coxeter's figure, marking it up to analyse the successively smaller circles[d] with which (he deduced) it had been constructed. He then constructed a diagram, which he sent to Coxeter, showing his analysis; Coxeter confirmed it was correct, but disappointed Escher with his highly technical reply. All the same, Escher persisted with hyperbolic tiling, which he called "Coxetering". 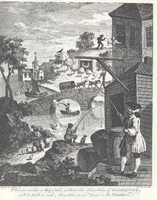 Among the results were the series of wood engravings Circle Limit I–IV. In 1959, Coxeter published his finding that these works were extraordinarily accurate: "Escher got it absolutely right to the millimeter". Escher's special way of thinking and rich graphics have had a continuous influence in mathematics and art, as well as in popular culture. The primary institutional collections of original works by M.C. Escher are the Escher Museum in The Hague; the National Gallery of Art (Washington, DC); the National Gallery of Canada (Ottawa); the Israel Museum (Jerusalem); and the Huis ten Bosch (Nagasaki, Japan). Despite wide popular interest, Escher was for a long time somewhat neglected in the art world; even in his native Netherlands, he was 70 before a retrospective exhibition was held. [g] In the twenty-first century, major exhibitions have been held in cities across the world. An exhibition of his work in Rio de Janeiro attracted more than 573,000 visitors in 2011; its daily visitor count of 9,677 made it the most visited museum exhibition of the year, anywhere in the world. No major exhibition of Escher's work was held in Britain until 2015, when the Scottish National Gallery of Modern Art ran one in Edinburgh from June to September 2015, moving in October 2015 to the Dulwich Picture Gallery, London. The exhibition moved to Italy in 2015–2016, attracting over 500,000 visitors in Rome and Bologna, and then Milan. Doris Schattschneider identifies 11 strands of mathematical and scientific research anticipated or directly inspired by Escher. These are the classification of regular tilings using the edge relationships of tiles: two-color and two-motif tilings (counterchange symmetry or antisymmetry); color symmetry (in crystallography); metamorphosis or topological change; covering surfaces with symmetric patterns; Escher's algorithm (for generating patterns using decorated squares); creating tile shapes; local versus global definitions of regularity; symmetry of a tiling induced by the symmetry of a tile; orderliness not induced by symmetry groups; the filling of the central void in Escher's lithograph Print Gallery by H. Lenstra and B. de Smit. The Pulitzer Prize-winning 1979 book Gödel, Escher, Bach by Douglas Hofstadter discusses the ideas of self-reference and strange loops, drawing on a wide range of artistic and scientific sources including Escher's art and the music of J. S. Bach. The asteroid 4444 Escher was named in Escher's honor in 1985. Escher's fame in popular culture grew when his work was featured by Martin Gardner in his April 1966 "Mathematical Games" column in Scientific American. Escher's works have appeared on many album covers including The Scaffold's 1969 L the P with Ascending and Descending; Mott the Hoople's eponymous 1969 record with Reptiles, Beaver & Krause's 1970 In A Wild Sanctuary with Three Worlds; and Mandrake Memorial's 1970 Puzzle with House of Stairs and (inside) Curl Up. [h] His works have similarly been used on many book covers, including some editions of Edwin Abbott's Flatland, which used Three Spheres; E. H. Gombrich's Meditations on a Hobby Horse with Horseman; Pamela Hall's Heads You Lose with Plane Filling 1; Patrick A. Horton's Mastering the Power of Story with Drawing Hands; Erich Gamma et al. 's Design Patterns: Elements of Reusable Object-oriented software with Swans; and Arthur Markman's Knowledge Representation with Reptiles. [i] The "World of Escher" markets posters, neckties, T-shirts, and jigsaw puzzles of Escher's artworks. Both Austria and the Netherlands have issued postage stamps commemorating the artist and his works. ^ "We named him Maurits Cornelis after S.'s [Sara's] beloved uncle Van Hall, and called him 'Mauk' for short ...", Diary of Escher's father, quoted in M. C. Escher: His Life and Complete Graphic Work, Abradale Press, 1981, p. 9. ^ The circled cross at the top of the image may indicate that the drawing is inverted, as can be seen by comparison with the photograph; the neighbouring image has a circled cross at the bottom. It is likely that Escher turned the drawing block, as convenient, while holding it in his hand in the Alhambra. 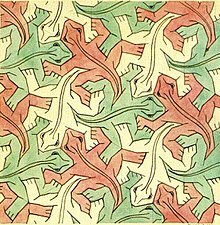 ^ Escher made it clear that he did not understand the abstract concept of a group, but he did grasp the nature of the 17 wallpaper groups in practice. ^ Schattschneider notes that Coxeter observed in March 1964 that the white arcs in Circle Limit III "were not, as he and others had assumed, badly rendered hyperbolic lines but rather were branches of equidistant curves." ^ In 1969, Escher's business advisor, Jan W. Vermeulen, author of a biography on the artist, established the M.C. Escher Foundation, and transferred into this entity virtually all of Escher's unique work as well as hundreds of his original prints. These works were lent by the Foundation to the Hague Museum. Upon Escher's death, his three sons dissolved the Foundation, and they became partners in the ownership of the art works. In 1980, this holding was sold to an American art dealer and the Hague Museum. The Museum obtained all of the documentation and the smaller portion of the art works. The copyrights remained the possession of Escher's three sons – who later sold them to Cordon Art, a Dutch company. Control was subsequently transferred to The M.C. Escher Company B.V. of Baarn, Netherlands, which licenses use of the copyrights on all of Escher's art and on his spoken and written text. A related entity, the M.C. Escher Foundation of Baarn, promotes Escher's work by organizing exhibitions, publishing books and producing films about his life and work. ^ The poster for the exhibition is based on Hand with Reflecting Sphere, 1935, which shows Escher in his house reflected in a handheld sphere, thus illustrating the artist, his interest in levels of reality in art (e.g., is the hand in the foreground more real than the reflected one? ), perspective, and spherical geometry. ^ Steven Poole comments "The artist [Escher] who created some of the most memorable images of the 20th century was never fully embraced by the art world." ^ These and further albums are listed by Coulthart. ^ These and further books are listed by Bailey. ^ a b c d e f g h i j k l "Chronology". World of Escher. Retrieved 1 November 2015. ^ a b c d e f "About M.C. Escher". Escher in het Paleis. Archived from the original on 27 January 2016. Retrieved 11 February 2016. ^ a b Bryden, Barbara E. (2005). Sundial: Theoretical Relationships Between Psychological Type, Talent, And Disease. Gainesville, Fla: Center for Applications of Psychological Type. ISBN 978-0-935652-46-8. ^ Monroe, J. T. (2004). Hispano-Arabic Poetry: A Student Anthology. Gorgias Press LLC. p. 65. ISBN 978-1-59333-115-3. ^ a b c d e f g O'Connor, J. J.; Robertson, E. F. (May 2000). "Maurits Cornelius Escher". Biographies. University of St Andrews. Retrieved 2 November 2015. which cites Strauss, S. (9 May 1996). "M C Escher". The Globe and Mail. ^ "Aircraft over the Netherlands". Stamp catalogue. Colnect.com. Retrieved 31 March 2016. ^ a b Hathaway, Dale K. (17 November 2015). "Maurits Cornelis Escher (1898 - 1972)". Olivet Nazarene University. Retrieved 31 March 2016. ^ a b "M.C. Escher stamps". Stamp catalogue. Colnect.com. Retrieved 31 March 2016. ^ Escher, M. C. (1989). Escher on Escher: Exploring the Infinite. Harry N. Abrams. ISBN 978-0-8109-2414-7. ^ "Timeline". Escher in het Paleis. Retrieved 14 March 2018. ^ "Snakes". M. C. Escher. Retrieved 5 November 2015. ^ Cucker, Felipe (25 April 2013). Manifold Mirrors: The Crossing Paths of the Arts and Mathematics. Cambridge University Press. pp. 106–107. ISBN 978-0-521-42963-4. ^ "M.C. Escher - Creating The "Snakes" Woodcut". YouTube. Retrieved 5 November 2015. ^ M.C. Escher, Netherlands Institute for Art History, 2015. Retrieved 6 November 2015. ^ M.C. Escher, Vorstelijk Baarn. Retrieved 6 November 2015. ^ a b "M.C. Escher — Life and Work". The Collection, National Gallery of Art. National Gallery of Art, Washington. Retrieved 1 November 2015. 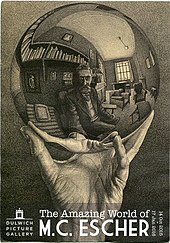 Escher and the interior of his studio in Rome are reflected in the mirrored sphere that he holds in his hand. Escher's preoccupation with mirrored reflections and visual illusion belongs to a tradition of northern European art established in the fifteenth century. ^ a b Altdorfer, John. "Inside A Fantastical Mind". Carnegie Museums. Archived from the original on 6 July 2010. Retrieved 7 November 2015. ^ McStay, Chantal (15 August 2014). "Oneiric Architecture and Opium". The Paris Review. Retrieved 7 November 2015. ^ Mansfield, 28 June 2015 (28 June 2015). "Escher, the master of impossible art". The Scotsman. Retrieved 7 November 2015. ^ Master the GRE 2013. Peterson's. 2012. p. 119. ISBN 978-0-7689-3681-0. ^ Pólya, G. (1924). "Über die Analogie der Kristallsymmetrie in der Ebene". Zeitschrift für Kristallographie (in German). 60: 278–282. doi:10.1524/zkri.1924.60.1.278. ^ a b c d e f g h i j k l Schattschneider, Doris (2010). "The Mathematical Side of M. C. Escher" (PDF). Notices of the AMS. 57 (6): 706–718. ^ Barry Cipra (1998). Paul Zorn (ed.). What's Happening in the Mathematical Sciences, Volume 4. American Mathematical Society. p. 103. ISBN 978-0-8218-0766-8. ^ Seckel, Al (2004). Masters of Deception: Escher, Dalí & the Artists of Optical Illusion. Sterling. pp. 81–94, 262. ISBN 978-1-4027-0577-9. Chapter 5 is on Escher. ^ Penrose, L.S. ; Penrose, R. (1958). "Impossible objects: A special type of visual illusion". British Journal of Psychology. 49 (1): 31–33. doi:10.1111/j.2044-8295.1958.tb00634.x. PMID 13536303. ^ Kirousis, Lefteris M.; Papadimitriou, Christos H. (1985). The complexity of recognizing polyhedral scenes. 26th Annual Symposium on Foundations of Computer Science (FOCS 1985). pp. 175–185. CiteSeerX 10.1.1.100.4844. doi:10.1109/sfcs.1985.59. ISBN 978-0-8186-0644-1. ^ a b c d e f g Poole, Steven (20 June 2015). "The impossible world of MC Escher". The Guardian. Retrieved 2 November 2015. ^ "The Official M.C. Escher Website – Biography". Retrieved 7 December 2013. ^ a b "Möbius Strip II, February 1963". Collections. National Gallery of Canada. Retrieved 2 November 2015. which cites Escher, M. C. (2001). M. C. Escher, the Graphic Work. Taschen. ^ a b c Emmer, Michele; Schattschneider, Doris; Ernst, Bruno (2007). M.C. Escher's Legacy: A Centennial Celebration. Springer. pp. 10–16. ISBN 978-3-540-28849-7. ^ Flocon, Albert; Barre, André (1968). La Perspective curviligne. Flammarion. ^ Emmer, Michele; Schattschneider, Doris (2007). M.C. Escher's Legacy: A Centennial Celebration. Springer. pp. 182–183. ISBN 978-3-540-28849-7. ^ Hargittai, István (23 May 2014). Symmetry: Unifying Human Understanding. Elsevier Science. p. 128. ISBN 978-1-4831-4952-3. ^ Beech, Martin. "Escher's Stars". Journal of the Royal Astronomical Society of Canada. 86: 169–177. ^ Coxeter, H. S. M. (1985). "A special book review: M. C. Escher: His life and complete graphic work". The Mathematical Intelligencer. 7 (1): 59–69. doi:10.1007/BF03023010. ^ Coxeter, H. S. M. Coxeter (June 1957). "Crystal symmetry and its generalizations". A Symposium on Symmetry, Transactions of the Royal Society of Canada. 51 (3, section 3): 1–13. ^ Malkevitch, Joseph. "Mathematics and Art. 4. Mathematical artists and artist mathematicians". American Mathematical Society. Retrieved 1 September 2015. ^ O'Connor, J. J.; Robertson, E. F. (May 2000). "Maurits Cornelius Escher". University of St Andrews. Retrieved 2 November 2015. which cites Schattschneider, D. (1994). Guy, R. K.; Woodrow, R. E. (eds.). Escher: A mathematician in spite of himself. The Lighter Side of Mathematics. Washington: The Mathematical Association of America. pp. 91–100. ^ "Copyrights&Licensing". M.C. Escher. Retrieved 2 November 2015. ^ "M.C. Escher Foundation". M.C. Escher. Retrieved 2 November 2015. ^ "Tour: M.C. Escher — Life and Work". National Gallery of Art. Archived from the original on 23 December 2015. Retrieved 4 November 2015. ^ "Collections: M.C. Escher". National Gallery of Canada. Retrieved 4 November 2015. ^ "May 2013 (newsletter)". Israel Museum Jerusalem. Archived from the original on 5 July 2014. Retrieved 4 November 2015. ^ "M. C. Escher" (in Japanese). Huis Ten Bosch Museum, Nagasaki. Retrieved 4 November 2015. ^ a b "The Amazing World of M.C. Escher". Dulwich Picture Gallery. Retrieved 1 November 2015. ^ "Hand with Reflecting Sphere, 1935". The Collection, National Gallery of Art. National Gallery of Art, Washington. Archived from the original on 25 December 2015. Retrieved 1 November 2015. ^ a b "Exhibition of works by Dutch graphic artist M.C. Escher opens at Soestdijk Palace in Baarn". Artdaily. Retrieved 17 November 2015. ^ a b "The Amazing World of M.C. Escher". National Galleries Scotland. Retrieved 1 November 2015. ^ a b "Escher. Santa Caterina Complex". Italy Traveller Guide. Archived from the original on 17 November 2015. Retrieved 17 November 2015. ^ "Top-attended museum show of 2011 is a surprise; also L.A. numbers". Los Angeles Times. 26 March 2013. Retrieved 18 November 2015. The exhibition was ranked No. 1 based on daily visitors. It saw 9,677 visitors a day, according to the Art Newspaper. ^ "Chiostro del Bramante, Rome". Archived from the original on 8 October 2014. Retrieved 7 November 2015. ^ "National Gallery of Canada". Retrieved 7 November 2015. ^ Schmadel, Lutz D. (2012). Dictionary of Minor Planet Names. Springer. p. 359. ISBN 978-3-642-29718-2. ^ Coulthart, John (7 February 2013). "MC Escher album covers". Archived from the original on 17 February 2013. Retrieved 2 November 2015. ^ Bailey, David. "M. C. Escher Miscellany". Archived from the original on 8 May 2017. ^ "M.C. Escher: An Artist for the Web". The New York Times. 28 September 2000. Retrieved 7 November 2015. Ernst, Bruno; Escher, M. C. (1995). The Magic Mirror of M. C. Escher. Taschen America. ISBN 978-1-886155-00-8. Locher, J. L. (1971). The World of M. C. Escher. Abrams. ISBN 978-0-451-79961-6. Locher, J. L. (1981). M. C. Escher: His Life and Complete Graphic Work. Abrams. ISBN 978-0-8109-8113-3. Schattschneider, Doris; Walker, Wallace (1987). M. C. Escher Kaleidocycles. Pomegranate Communications. ISBN 978-0-906212-28-8. Schattschneider, Doris (2004). M. C. Escher : Visions of Symmetry. Abrams. ISBN 978-0-8109-4308-7. Schattschneider, Doris; Emmer, Michele, eds. (2003). M. C. Escher's Legacy: a Centennial Celebration. Springer-Verlag. ISBN 978-3-540-42458-1. Veldhuysen, W. F. (2006). The Magic of M. C. Escher. Thames & Hudson. ISBN 978-0-500-51289-0. "Math and the Art of M.C. Escher". USA: SLU. Escherization problem and its solution. CA: University of Waterloo. "M.C. Escher: Life and Work". USA: NGA. Archived from the original on 3 August 2009. "US Copyright Protection for UK Artists". UK. Archived from the original on 19 October 2011. Retrieved 3 November 2011. Copyright issue regarding Escher from the Artquest Artlaw archive. Schattschneider, Doris (June – July 2010). "The Mathematical Side of M. C. Escher" (PDF). Notices of the American Mathematical Society. 57 (6): 706–18. Retrieved 9 July 2010.